Indian jhoomer, earring & tikka set in silver colour & white; set with faux pearl & crystal diamante stones. Indian Jewellery Store loves this product because it looks so pretty when worn and this jewellery is super light weight for your comfort. Set includes: beautiful pearl & crystal adorned smaller earrings, tikka & jhumar. Dimensions:- Jhoomer: 5.2cm wide, 11.5cm long including peal drops but excluding crystal chain at top of jhoomer. Earrings: 3.2cm max wide, 7.5cm long. Tikka: 2.8cm wide max. Limited edition jewels at an amazingly low price. 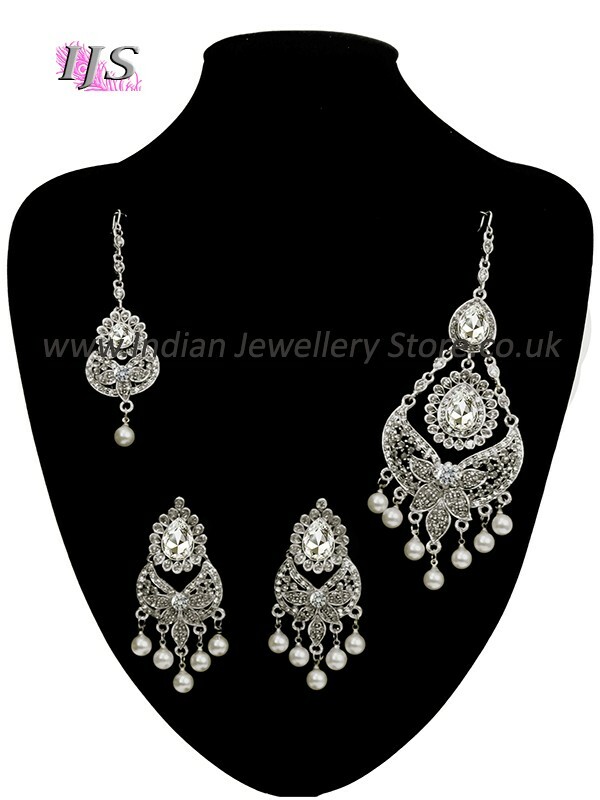 Indian jhoomer, earring & tikka set in silver colour & white; set with faux pearl & crystal diamante stones. Indian Jewellery Store loves this product because it looks so pretty when worn and this jewellery is super light weight for your comfort. Set includes: beautiful pearl & crystal adorned smaller earrings, tikka & jhumarDimensions:- Jhoomer: 5.2cm wide, 11.5cm long including peal drops but excluding crystal chain at top of jhoomer. Earrings: 3.2cm max wide, 7.5cm long. Tikka: 2.8cm wide max. Limited edition jewels at an amazingly low price.